This was an eventful month: I started my full-time job, went on a business trip to Chicago, and am now in the process of moving to my new apartment. All of that gave me a little less time to blog than usual. My new office-dwelling lifestyle takes a bit of getting used to, and I can feel my shopping habits and wardrobe preferences changing as a a result. Although I've had a few summer internships that gave me some basis for anticipating my office wardrobe needs, I've changed my mind on a few things, such as my willingness to wear pants as part of my business casual outfits. Shopping-wise, I went a fair bit over my $250/month budget for fashion purchases this month, but I don't worry too much about that because I've been under budget for a few months, and I'm still on track to come in under my limit for the year. There are times now when I feel as if I'm possibly too busy to shop, but I obviously end up shopping anyway. The real budget-buster this month was my jeans, and that is a purchase I hope I don't have to repeat anytime in at least two years, if not longer. J. 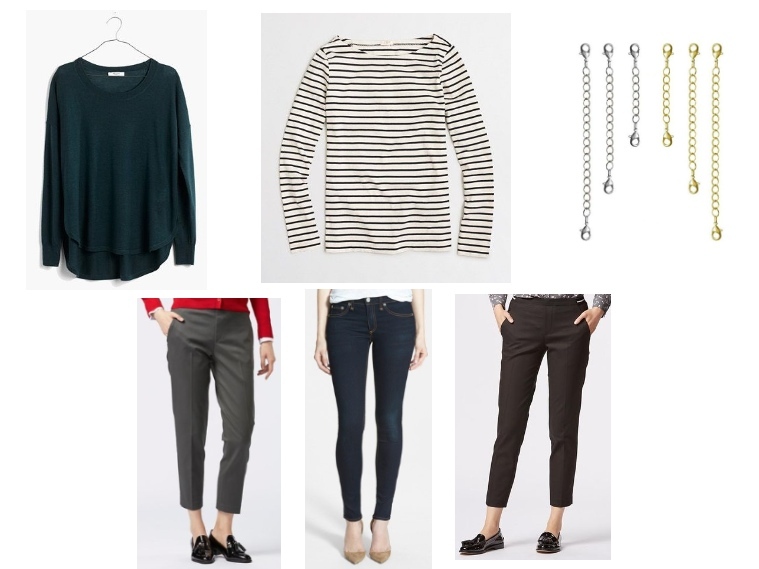 Crew Factory Long-Sleeve Striped Boatneck Tee - $34.50* - This was one of my "Five Piece French Wardrobe-ish" choices for the fall/winter season. I reviewed it here. Madewell Northstar Pullover, Vintage Forest - $45.15 - I love the color, and I like the slouchy fit. It is 100% merino wool, which is nice in theory. Sadly, between this sweater and some other 100% wool sweaters I bought from Madewell last year, I'm about to conclude that it might be best to avoid their sweaters in the future. They just don't hold up that well to frequent wear and even the very gentle hand-washing I do with my sweaters. Uniqlo Cotton-Blended Ankle Length Pant, Dark Green - $39.90 - I reported on these pants and how they compared to a similar poly-blend style from Uniqlo here. I find that the Dark Green shade is indistinguishable from gray in basically any lighting. Uniqlo Cotton-Blended Ankle Length Pant, Black - $39.90 - I've mainly been wearing the black pair to work, and I like them so far. They do tend to attract lint a bit more than my other pair of poly-blend work pants from Loft. Because these have an elastic waist, it is difficult to get as good a fit from these as from other pants, but this style works well for me. Necklace Extenders - $6.00 - I wanted to extend the length of that Gorjana necklace from a few months ago so that it would work better with a short necklace that I wear daily. These are shipped from China, but they arrived in about two weeks, which is reasonably quick. Fresh Sugar Deoderant Antiperspirant - $18.00 - I've used this product on and off for a while, and I keep going back to it. It is expensive, but I really dislike the smell of a lot of drugstore antiperspirants, and I often have problems with allergic reactions. MAKE UP FOREVER HD Pressed Powder - $36.00 - I used to use MUFE's loose powder, but that tended to be messy. I bought the smaller version of the pressed powder earlier this year and it was much more practical, especially for traveling, but it runs out a lot faster than the loose powder. I'm trying the larger size of the pressed powder now, and hopefully it doesn't run out too fast. Linking up with Franish and the other Budgeting Bloggers again this month. Be sure to check out what everyone else bought!